I thought I’d record some of my meals this week, and allow you all to marvel at my food photography skills. Not. Anyway, on Monday I ate half and avocado, a packet of flaked salmon and some salad, followed by dry-roasted peanuts. Of all the things I ate this week, this was the most aesthetically pleasing. I’m no food stylist as my photos on this blog testify, but it’s hard to make chopped avocado, salad and flaked salmon look rubbish. 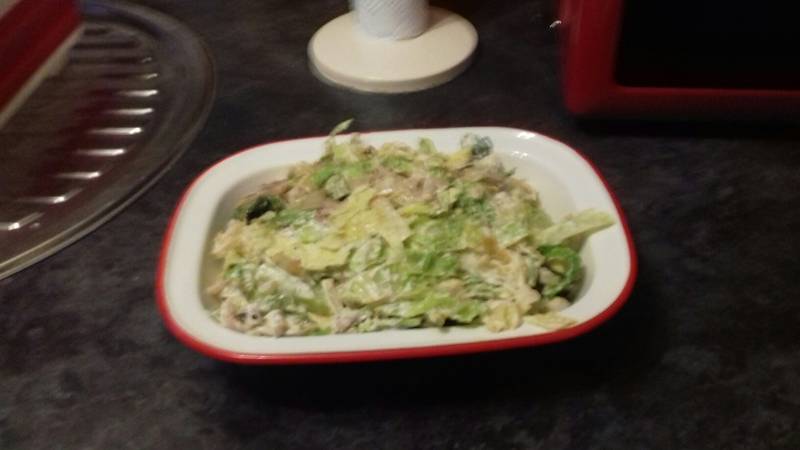 On Tuesday, I ate a Caesar salad—partly to use up chicken we had in the freezer and partly to get rid of some of the jar of anchovy paste I bought the other week, which is destined to turn mouldy before I get round to using it all up*. My version of the dressing is this: whole egg, 100ml rapeseed oil, one clove of garlic, crushed, one rounded teaspoon anchovy paste, juice of half a lemon and 25g grated parmesan. Whisk together and use up within a few days. Wednesday, I went for weirdness—two boiled eggs, cauliflower with a tin of anchovies chopped and mixed through, and the oil in the tin used to dress a salad. I’m eating tonnes of anchovies at the moment. They feel as if they are eco-friendly, super-healthy and those tins are dirt cheap. On Thursday, I attempted a cauliflower risotto a la the Diet Doctor, as I wanted to try a new recipe. Cream, cheese, cauliflower and mushrooms… what’s not to love?! I’ve added the link to the recipe and you can see what it looks like when people who know how to make food look enticing get their hands on it. Saturday, I decided, needed to be treat-worthy. ‘Treat-worthy’ is a subjective term. For my husband, it’s sirloin steak and chips whereas I can take or leave steaks. I’d rather eat a cheese omelette, so that’s what I did, doing my best to recreate a fluffy omelette I had in a cafe in Knaresborough last summer. Throughout the week, I snacked on nuts. This week’s headlines about diabetes included a piece about nuts and how they might reduce the risk of cardiovascular problems for those with type 2 diabetes. That’s good enough for me. I love nuts—salted, smoked almonds in particular. But I’m happy to eat handfuls of the natural, unsalted varieties too. What did that poor packet ever do to you? Did you have a favourite meal this week and what was it? Let us know in the comments below. *Does anyone know any other uses for the stuff? The jar suggests pasta and pizza, both out for obvious reasons. Boredom is the enemy of healthy eating, right? It’s easy to be enthusiastic five days into low-carb dieting, but 20 days later? Not so much. I suffer from this myself. Sometimes, you long to nose-dive into a gigantic bowl of crisps. Or scarf down eight slices of bread, covered in butter. Here are some ideas for keeping boredom at bay. Do try out lots of different recipes. Most of us rotate the same meals week in/week out. When you’re restricting what you’re eating, that’s a double whammy. We’ve lots of suggestions here, but the Grand Daddy of diabetes-friendly recipes is The Diet Doctor. There, you’ll find various carb counts, vegetarian choices, fish, meat and eggs ideas in abundance. Look for different texture. Low-carb foods can lack crunch. (Think crisps, crackers and more.) Pork rinds are crunch-tastic. Make them yourself by cutting pork skin into strips and tossing with a little sea salt and hot smoked paprika. Place them on a rack over a tray and whack in a very hot oven for 25-30 minutes. You can buy them too. De-carb your favourite recipes. Missing bread? Try our easy, low-carb version here. Use cauliflower for rice or those zero noodles to make Chinese and Asian-inspired dishes. Cauliflower also makes fabulous mash. Eat enough. Boredom might be hunger in disguise. Work out your calorie allowance for your levels of activity and ensure you’re meeting it. Adding cheese, cream and mayonnaise to dishes is an easy way to bump those numbers up. Try new foods. Yes, branch out and eat something you thought you hated. Liver, cabbage and sprouts (not all together) might turn out to be delicious. Have at least two or three go-to sweet recipes. Humans love a sweet taste. While you might want a low-carb diet to get rid of yours, the wise woman (or man) has low-carb options on hand just in case. Try our peanut chocolate fudge for a sweet hit. Or this recipe for ice-cream. Eat high-carb occasionally. Make it worth it, though. I ate a slice of chocolate cake recently which was…average. I muttered to myself afterwards, “Well, that was a total waste of carbs.” Choose the very best you can and eat in the evening, rather than at lunchtime or breakfast as the resultant tiredness won’t matter so much. For a book stuffed to the gunnels with low-carb recipes, The Diabetes Diet (now available in print and e-book format) is your number one choice. Have you been caught out by the vegetable shortage in the shops? British supermarkets have run short of courgettes, spinach and other salad items thanks to bad weather in Spain and Italy. If you follow a low-carb diet, you probably rely more on such vegetables than the average person. I decided to see what I could do with Scottish ingredients. The Diet Doctor website features a lot of cabbage, including main course and side dishes that use this vegetable. Most supermarkets stock Scottish or British-grown cabbage so there are no issues there with availability. The Diet Doctor’s Cabbage Casserole can be made exclusively with Scottish ingredients, supporting our farmers and growers. I adapted the recipe slightly and here it is. Allow about 10g net carbs per serving and serve with pork chops, roast chicken legs or steak. Please note – you’ll need a large saucepan because 450g cabbage is bulky. It reduces in size as it cooks. Melt the butter in a large saucepan. Add the cabbage and onion and mix well to coat in the butter. Cook gently for about seven minutes. You want the vegetables to be softened but not browned. Add salt and pepper and the garlic and cook for one minute more. Mix the sour cream and soft cheese. Stir into the cabbage. Place the mixture in an ovenproof dish, top with the grated cheese, a good helping of black pepper and cook in the oven for 15 minutes. Low-carb pizza for dinner? Anyone who follows a low-carb diet for diabetes is probably familiar with the work of Dr Andreas Eenfeldt. The Swedish practitioner set up the Diet Doctor blog in 2007. The blog is now the most popular health blog in Scandinavia and the website offers all kinds of useful resources for those wanting to take up a low carb high fat diet. There are expert videos, how to courses and lots of recipes. I decided to try one out this week – for low-carb pizza. This version uses aubergine slices to replace the bread. I adapted it slightly, but you can see the original recipe here. Don’t forget that our book, The Diabetes Diet contains plenty of low-carb recipes and advice on how to adjust your medication when you embark on a low carb diet, which applies to those with type 1 and type 2 diabetes. 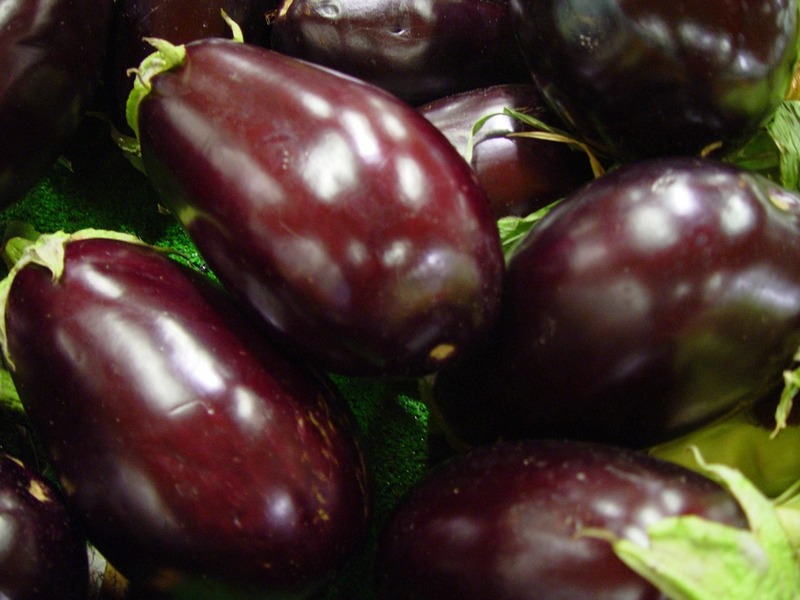 Slice the aubergines length-wise about ⅓–½ inches (1 cm) thick. Coat with olive oil and bake in oven for about 20 minutes or until they turn a little in colour. Turn them half-way through cooking. Fry the meat, finely chopped onion and garlic in pan until the onions have softened the meat is browned. Add the tomato sauce and seasoning. Let the mixture simmer for 10 minutes or more. Remove the aubergine slices from the oven and spread the meat mixture on top. Sprinkle with cheese and oregano. Place in the oven for about 10 minutes or until the cheese has melted. Allow roughly 10-13g of carbohydrates per portion.